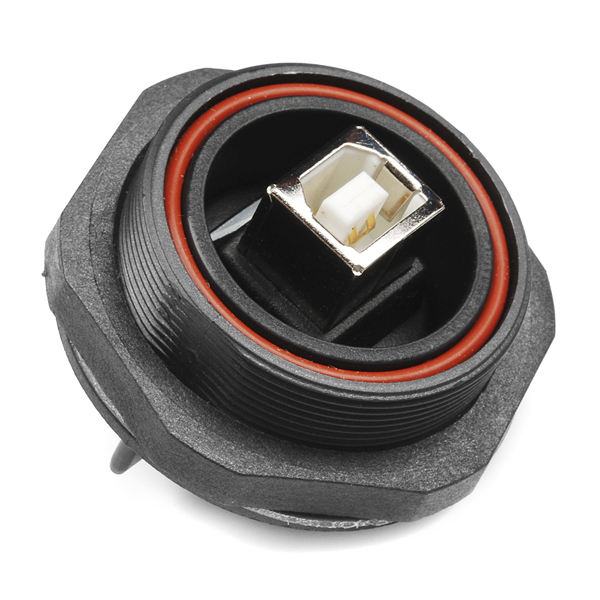 These USB-B type connectors are housed in a molded plastic assembly with O-rings and panel gaskets to keep your panel mount USB connection not only dust proof, but waterproof as well. The front of the assembly is threaded to accept a mating waterproof cable *or *sealing cap (which can be found in the related products below) that maintains the waterproof seal when there's nothing connected. Skill Level: Competent - You might need to break out the power tools. Nothing beyond a power drill or rotary tool should be required, but you might have a hard time with just a screwdriver and hammer. Cutting holes into plastic or metal might be required. Will Female Jumper Wires plug into this? This is pretty useful but the price is too high. This isn't much good without the cap; any plans to offer an alternative? Wish there was a blank version of these for making custom waterproof connection ports. Another way to make sure the unit is oriented the right way for the pinout is to look at the USB connector side, the white triangle on the connector should be on the top. I'm sure this is the pinout because I took a USB cable, cut it in half then used the wires and a multimeter to map the wires to the pins- the PDF in the document linked to above doesn't orient to map pin 1, and the pinout described elsewhere in the comments is just wrong. How would you connect this to arduino? Any tips on creating the 36mm panel mount hole? If you don't have access to the right size drill or hole saw, you might try an adjustable circle-cutting tool like these. I'll warn you that these are best used in a drill press; they're not balanced and can bind and snap when used in a hand drill (don't ask how I know). How do you wire this? 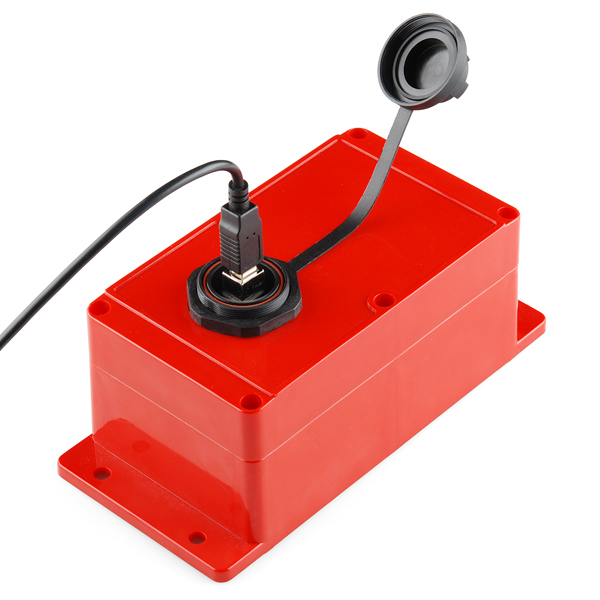 There are five pins, ground and power rail and those can be checked using a multimeter. But for data? I need to wire this up for an Arduino weather logger proyect that will be held inside of enclosure, and by stripping a usb A to B cable and then connect it to the Arduino. Anyone here knows how to wire it? And also if someone knows the correct pin order it will be very helpful too. 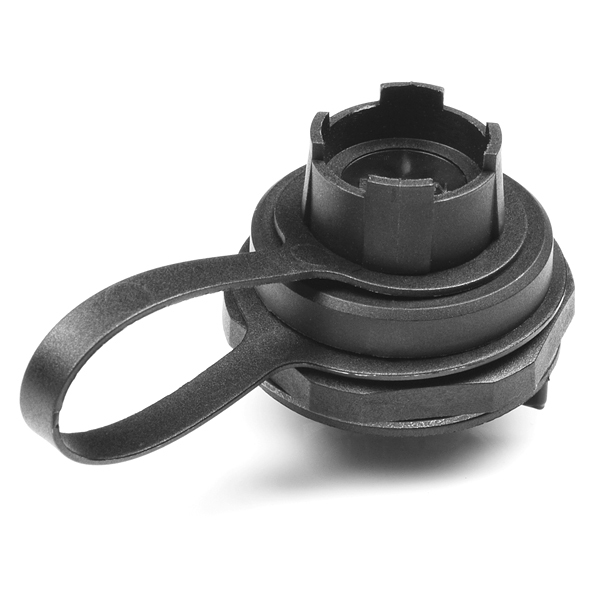 The bulgin buccaneer series is good for weather and water resistent sealing, but for true waterproof sealing, you need to be very familiar with how these plugs work and how to properly connect them. I used two of these for a ROV I built half a year back. One was a two contact power and the other was an ethernet port. The Ethernet port sealed very nicely, but the power did not. It was probably due to the tight tolerances wire size and shape, but overall, they were difficult to use properly. The ethernet port was tested to be waterproofed up to 20 ft. I think Bulgin claims them to be waterproof tested at 10M for 1 or 2 weeks. 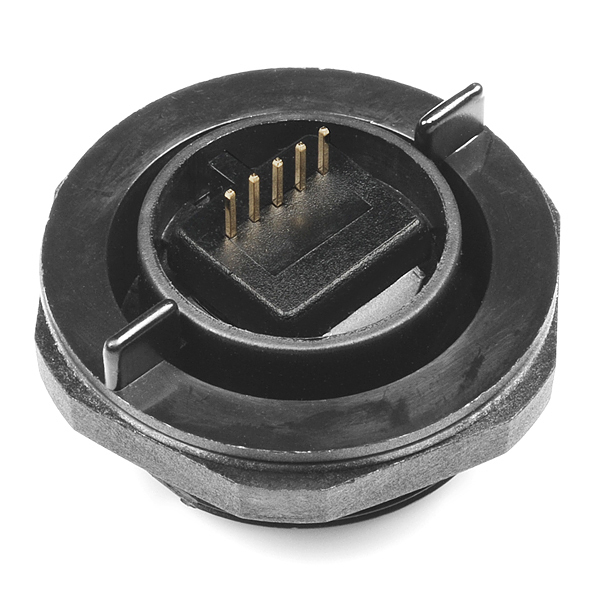 The caps for the connectors also give the same sealing quality (even better sometimes), so they are good for just about any rugged environment. I hope this helps with whoever that wishes to use these for waterproof purposes. Can you look into getting the keyed pinned connectors or are they just way too expensive from your suppliers? The description of the cable says "bayonet style", the connector listed on this page is threaded. An added comment. These are great connectors, but one caveat. We used this product family for a ship board application that needed a IP68 rated usb key port. The connectors are only water/dust rated when they have the cover or proper cable attached. You have to use the cables or the cover that have the dust/water tight end on them that screws onto this connector. We had users leaving the cover off, and water would get into our instruments. If you follow the rules, it is a great connector. Where can you get cables or keyboards and whatnot that mate with the threads? we can look into getting the mating USB cable connector. If you need them before SF gets them, it think you can get them from the big electronics places online. The issue is getting ones that mate with these threads. The spec sheet doesn't seem to show the thread pitch. It looks like there are multiple standards for weather resistant USB connectdors. We used this same connector on a autonomous robot I worked on in college for the Intelligent Ground Vehicle Competition. Great connectors, ours have been on the platform for 4 years and have held up awesome!